Nächster Paukenschlag im Junior-Goldminen-Sektor. 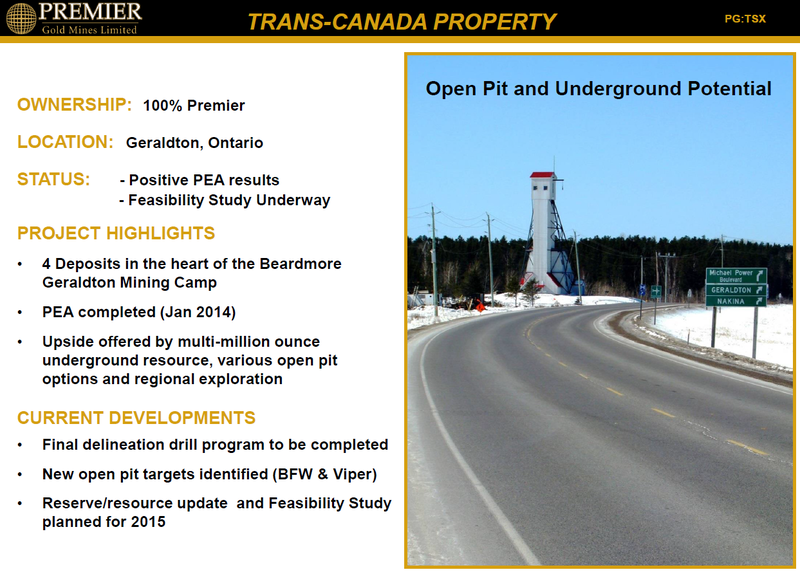 Goldproduzent Centerra Gold (TSX:CG) erwirbt ein 50%iges Interesse an Premier Gold Mines' (TSX:PG) Multi-Millionen Goldunzen-Projekt Trans-Canada im sicheren Ontario..
Centerra Gold is the latest to enter the fray in the hunt for Canadian gold assets. 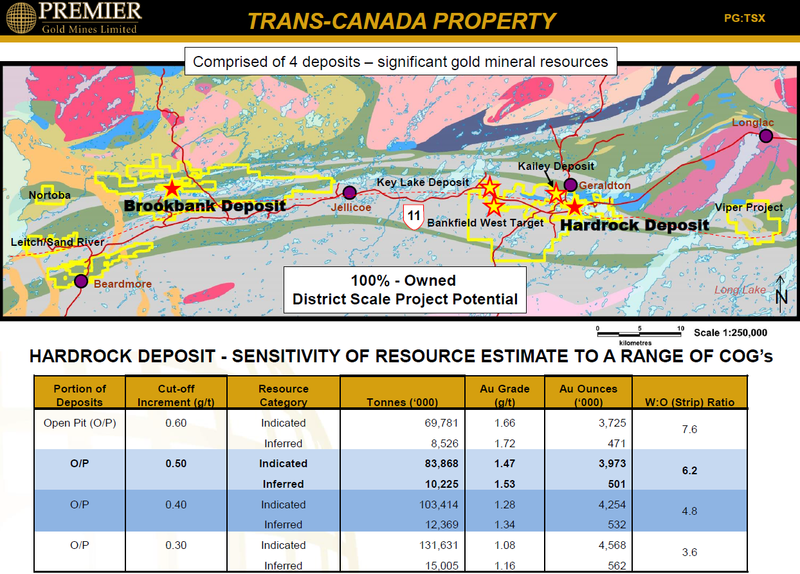 Ontario, Canada, one of the most prolific gold-bearing and mining regions in the world, continues to attract acquisitions early this year. 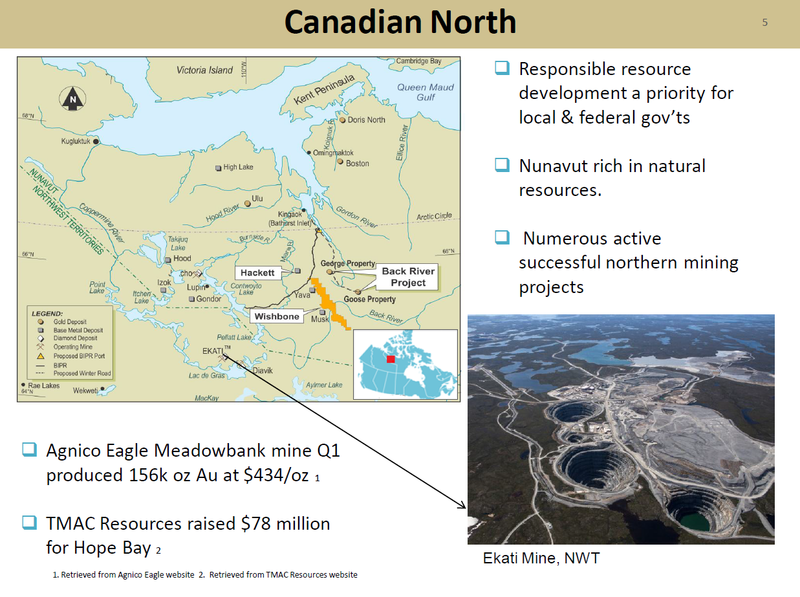 In January Goldcorp pulled the trigger on a friendly ~C$500 million share deal for Probe Mines, expanding its footprint in the Porcupine district if the deal goes through. 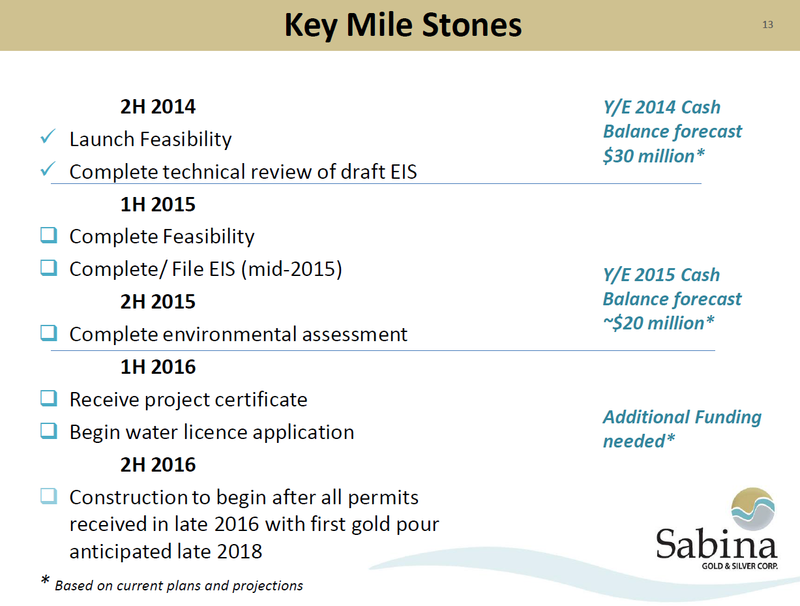 The apple of its eye was Probes Borden Gold project, near Chapleau Ontario and 160 kilometres away from Goldcorp’s Porcupine mine. 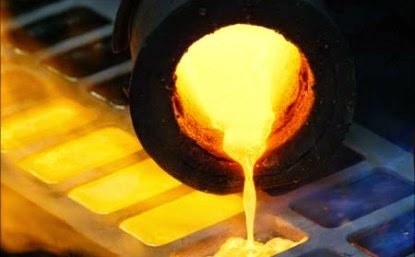 The major gold miner sees hauling ore to its existing facilities, rather than building a new mill, giving it a leg-up in pursuing Probe..
"Repatriate our Gold“-Bewegung, Business Week: "Where's Mein Gold? 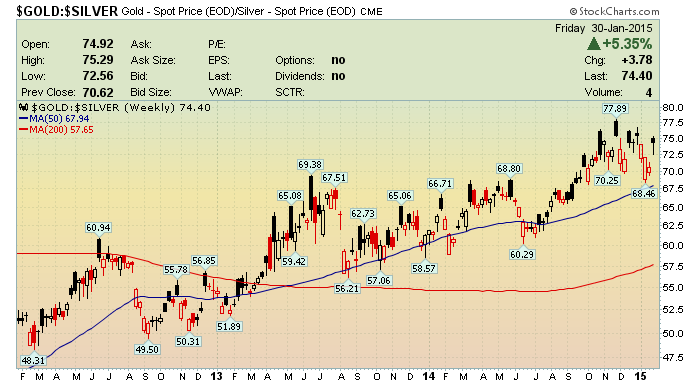 A German Metal Bug's Campaign Opens Fed Vault"
“… The gold may be in order. The gold may not be in order. 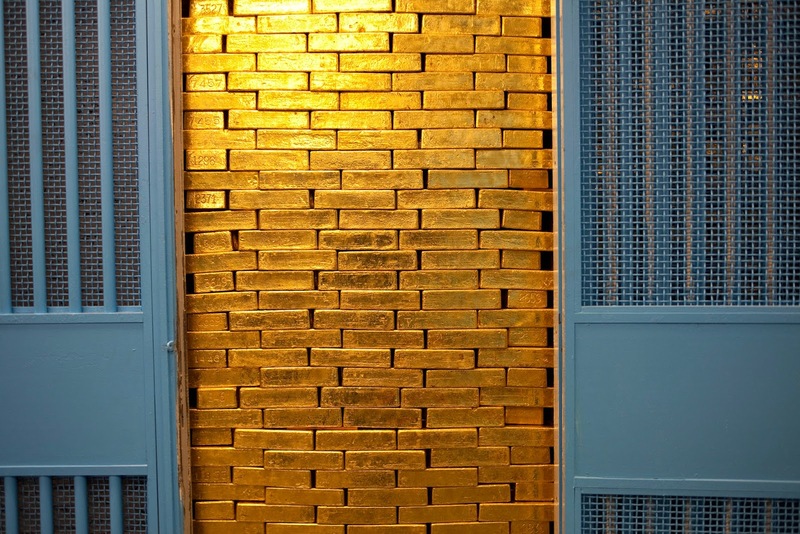 But either way, gold bugs around the world are winning unprecedented concessions from their governments, and gold is streaming out of 33 Liberty St. [NY Fed] and across the Atlantic. In May 2014, the Bank of Italy, which has the third-biggest gold reserves after the U.S. and Germany, ended years of secrecy by disclosing the locations of its holdings. Citing the German repatriations, the central bank said about half its gold is in Rome and most of the rest is beneath the New York Fed. 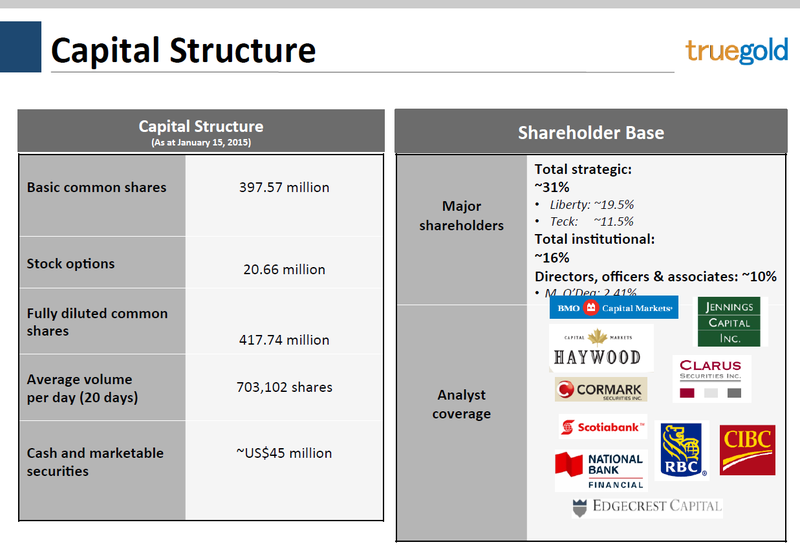 Then in November, the Dutch central bank announced that it had secretly moved 122.5 tons of gold from New York to Amsterdam..
VANCOUVER, BRITISH COLUMBIA--(Marketwired - Feb. 4, 2015) - Sabina Gold & Silver Corp. (the "Company") (TSX:SBB) reports changes to the Company's management team effective February 15, 2015. 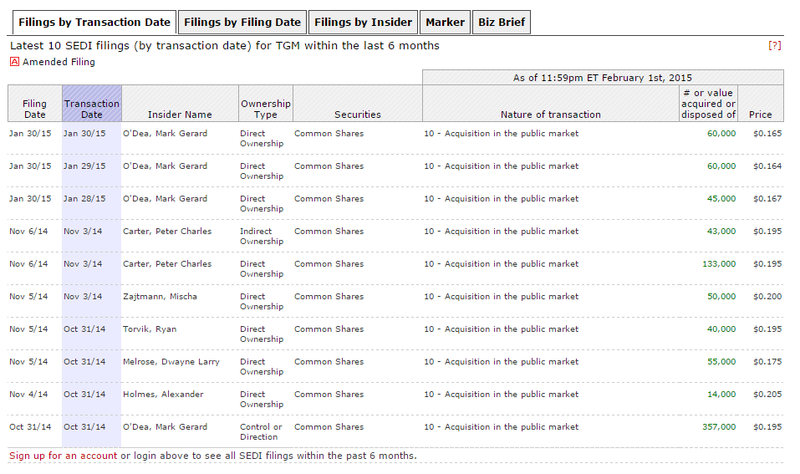 In late 2014, Mr. Pease expressed to the Board of Directors of the Company that he wished to retire in 2015. 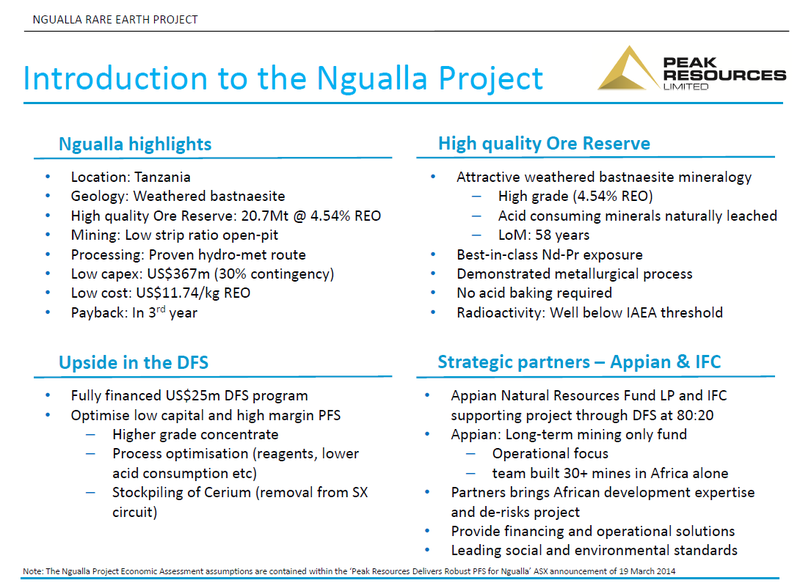 Mr. Pease joined the Company in late 2011 and during his tenure has overseen the Company's transition from a junior explorer into an emerging gold developer. Given Rob's desire to step down, the Board of Directors formed a search committee in late 2014 culminating in the appointment of Bruce McLeod to the role of President and CEO of Sabina effective February 15, 2015. 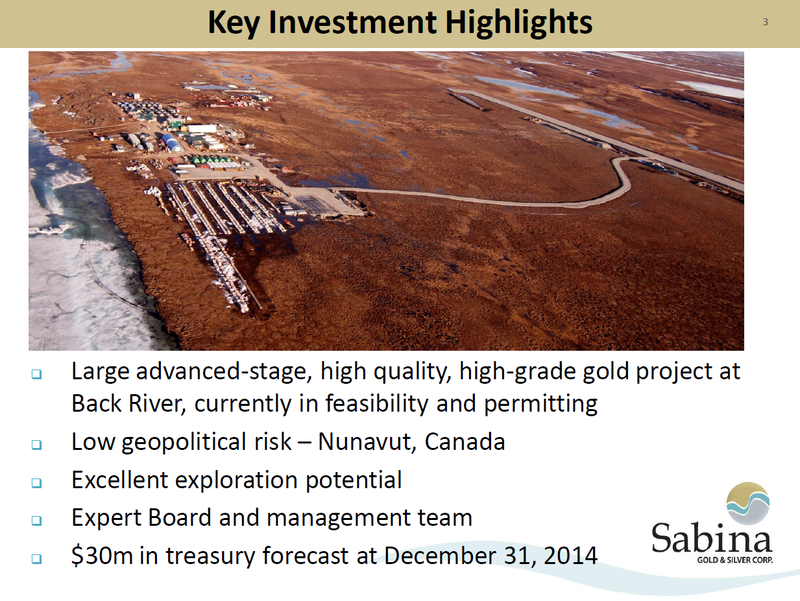 "We are very fortunate to have Bruce to lead the Sabina team as we move towards our goal of becoming a gold producer," said Roy Wilkes, Chairman of the Board. "His technical, operating and capital markets experience will be invaluable for the Company as we move forward and the Board of Directors and management team give him our full support." "We wish Rob all the best in his retirement and express our appreciation for his dedication and commitment to the Company over the last three years. 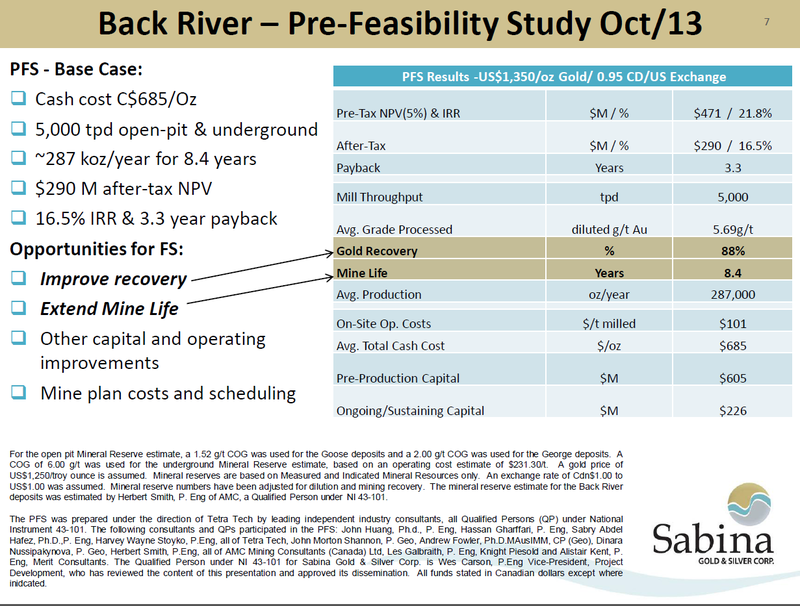 We are excited about what the future holds for Sabina and Back River as we continue to build shareholder value.."
Ganz starke News bei Peak Resources (ASE:PEK), die nun genügend Kapital von erstklassigen Investoren für die finale Machbarkeitsstudie (BFS) eingesammelt haben, um eines der attraktivsten Projekte im Rohstoff-Sektor der Seltenen Erden (Ngualla) weiterzuentwickeln..
PERTH, Australia, Feb. 3, 2015 /CNW/ - Peak Resources Limited ("Peak" or "the Company"; ASX Code: PEK) is pleased to announce signing of formal agreements related to its previously announced funding transactions with Appian and IFC for ~A$29.5 million, which is expected to fully fund Peak's Bankable Feasibility Study ("BFS") for the Ngualla Rare Earth Project. 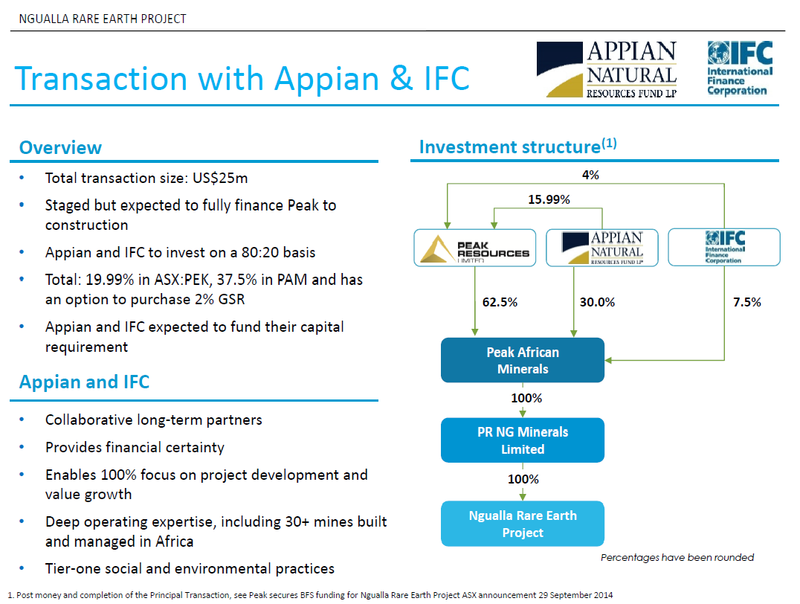 Michael W Scherb, Appian's founder said, "Appian is delighted to be a long term and collaborative partner as the Company advances development of the Ngualla Project. After our extensive Due Diligence process we have been very impressed with the Peak management team, Board and the Project. 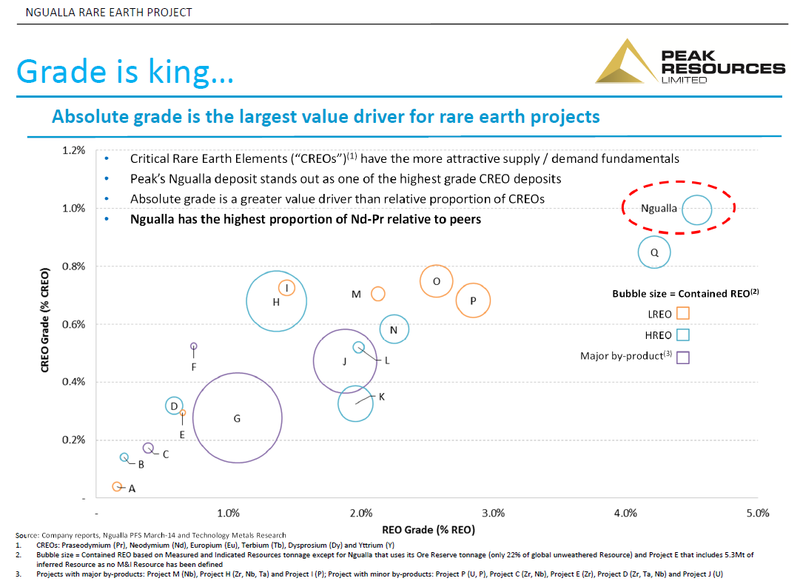 We have carried out extensive benchmarking exercises and we rate Ngualla as one of the world's best undeveloped rare earth projects with strong alignment to the high growth magnet metals market and which we believe will emerge as one of the lowest cost and most competitive rare earth projects globally." Darren Townsend, Peak's Managing Director said, "We are extremely pleased to have completed the formal documentation stage of the transaction. 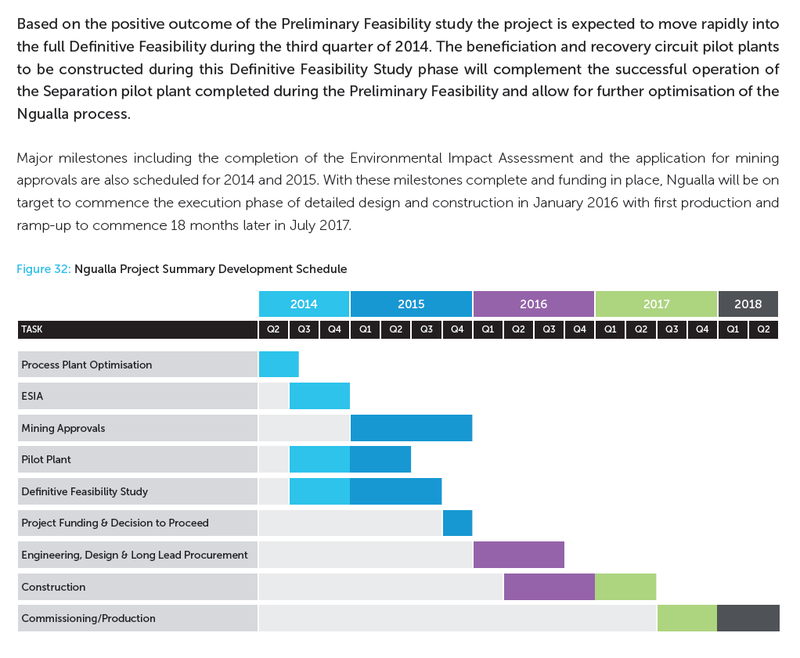 This is a significant step towards financially derisking the Ngualla Rare Earth Project as we move to the next stage of development and will enable us to maintain strong momentum following the considerable technical progress we have made.."
Columbus Gold (TSX-V:CGT) startet auf dem zweiten Hauptprojekt, Eastside in Nevada, ein ansehnliches Bohrprogramm mit einem Umfang von mehr als 45.000 Bohrmetern. 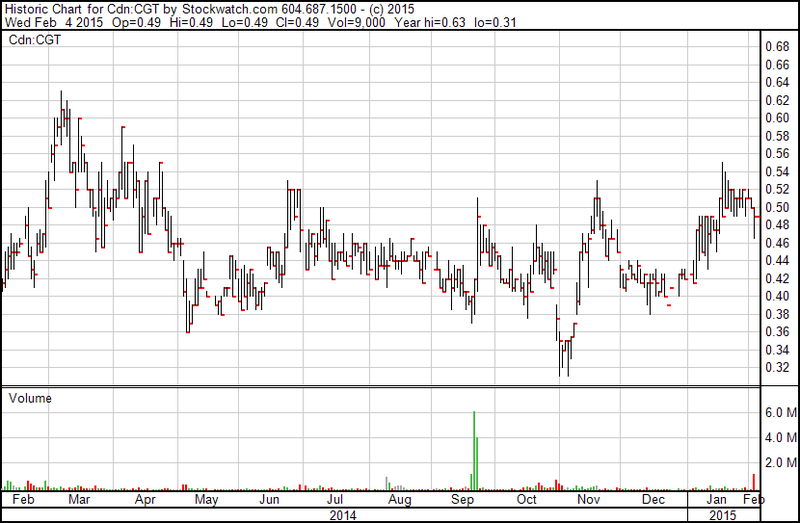 Der Newsflow wird in 2015 damit sehr hoch bleiben..
VANCOUVER, BC--(Marketwired - February 04, 2015) - Columbus Gold Corporation (TSX VENTURE: CGT) (OTCQX: CBGDF) ("Columbus Gold") is pleased to announce that a US$6.5 million exploration program at its 100%-owned Eastside gold discovery in Nevada is presently planned to commence in the 2nd quarter of 2015. 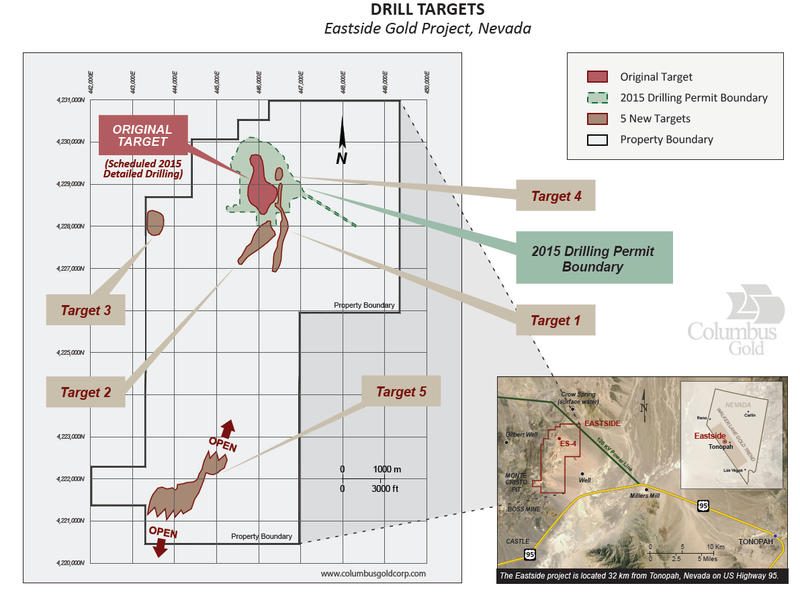 To date five targets have been identified at Eastside, however permitting efforts are focused on the original discovery, referred to as the Original Target and on Target 4, and the northern part of Target 1. 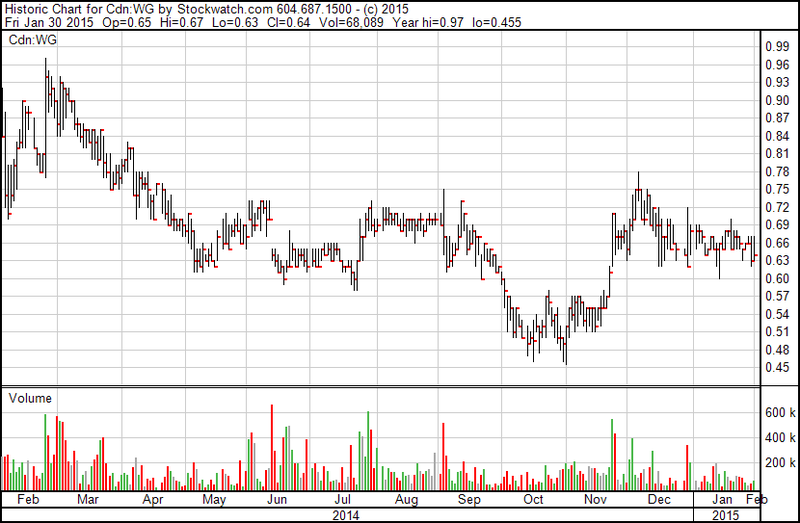 Please refer to the Target Map at the link below..
Starkes Vertrauenssignal bei True Gold Mining (TSX-V:TGM), die sich seit geraumer Zeit in der schwierigsten Situation der Unternehmens-Historie befinden. Der renommierte Gründer, Chairman und neustens sogar CEO von True Gold, Mister Mark O'Dea höchstpersönlich, legte am offenen Markt letzte Woche nach und kaufte weitere 165.000 True Gold-Aktien. Damit summieren sich die Insider-Käufe von O'Dea alleine während der letzten Monate auf über 650.000 Aktien. O'Dea kontrolliert nun knapp 10 Mio. 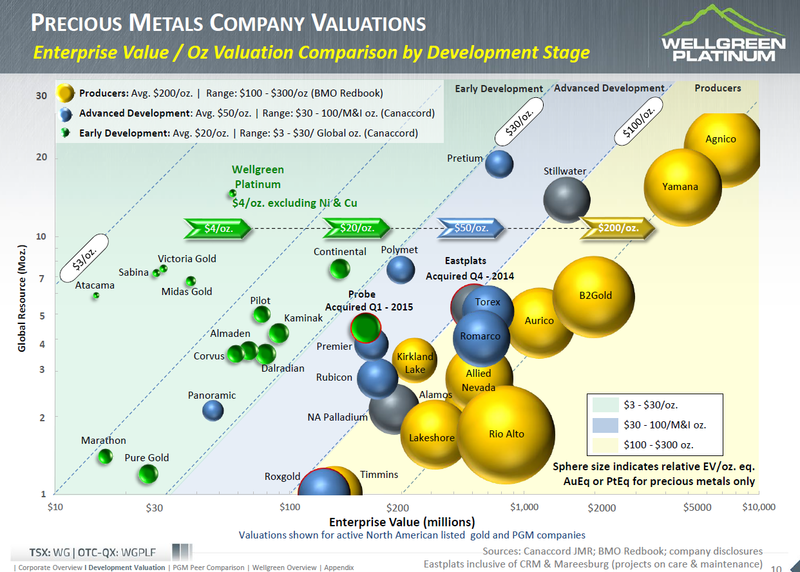 Anteile an True Gold Mining.. 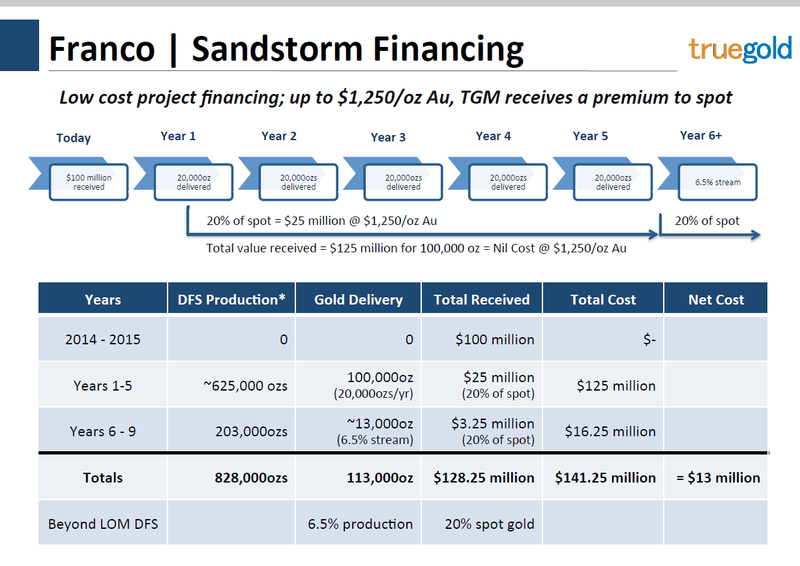 True Gold's Verantwortliche halten damit wie die strategischen, weltklasse Aktionäre Liberty Metals & Mining und Teck Resources (NYE:TCK) inkl. der erstklassigen Projekt-Partner Franco-Nevada (NYE:FNV) und Sandstorm Gold (TSX:SSL) weiterhin komplett zu der Story und bekräftigen ihr Vertrauen und ihre Überzeugung in den zukünftigen Werdegang (siehe auch die letzte NR). 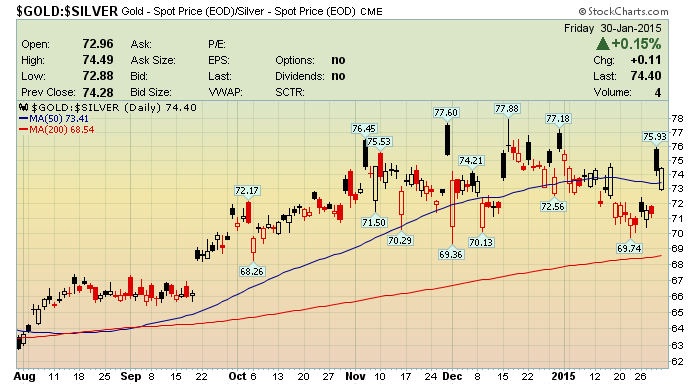 Der fortgeschrittene Gold-Projektentwickler True Gold Mining (TSX-V:TGM) gibt nach zahlreichen 'bad news' letzte Woche ein positives Unternehmens-Update bekannt..
WOT Analysis: Will Gold Equities Outperform Gold Bullion This Year? As of Thursday, assets in exchange-traded gold products rose for a tenth session, reaching the highest level since October. 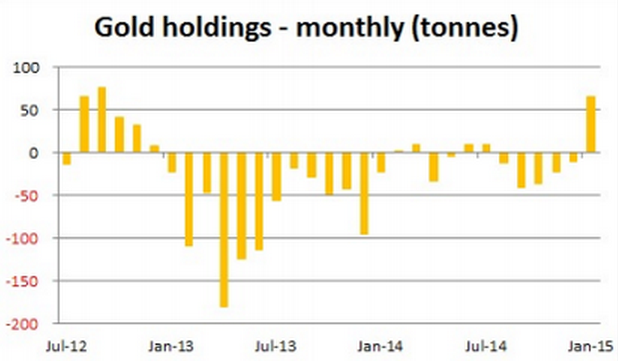 Investors added 65.6 metric tonnes so far this month, the most since September 2012. 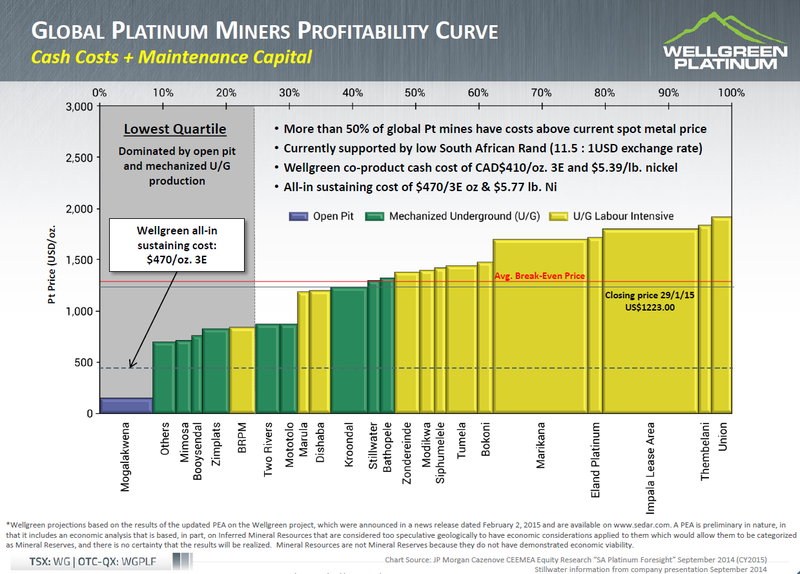 Gold equities, as measured by the NYSE Arca Gold Miners Index, are up 20 percent for January while the S&P 500 Index finished down 3 percent..
Projektentwickler Wellgreen Platinum (TSX:WG) publiziert heute eine ansehnliche, vorläufige Wirtschaftlichkeitsschätzung (PEA) für das fokussierte Wellgreen PGM-Nickel-Projekt im kanadischen Yukon..
VANCOUVER, BRITISH COLUMBIA--(Marketwired - Feb. 2, 2015) - Wellgreen Platinum Ltd. (TSX:WG)(OTCQX:WGPLF) is pleased to announce the positive results of an updated Independent Preliminary Economic Assessment (2015 PEA) on its 100%- owned Wellgreen PGM-Nickel project, located in Canada's Yukon Territory. 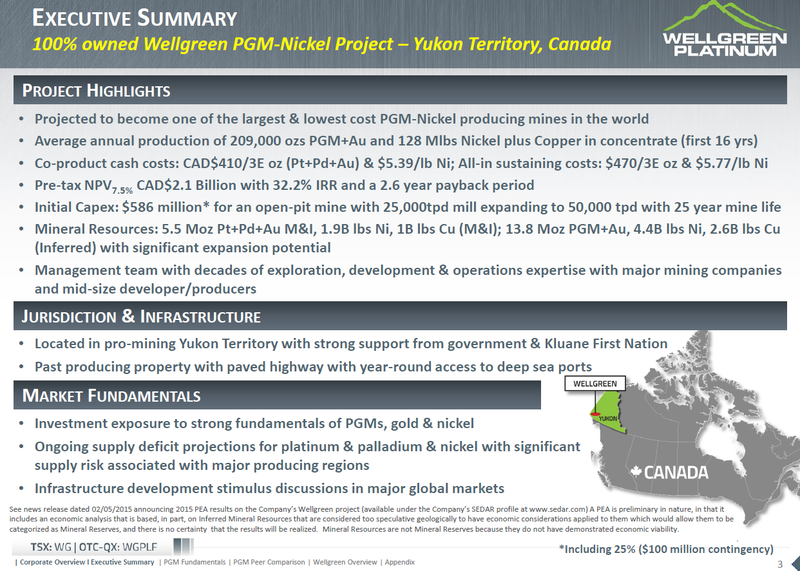 The new study strengthens the Company's vision that the Wellgreen project has the potential to become one of the largest and lowest cost, open-pit platinum group metals (PGMs) and nickel producing mines in the world. (1)Work on the 2015 PEA was carried out in reference to the requirements of National Instrument 43-101 - Standards of Disclosure for Mineral Projects (NI 43-101), and was conducted by independent engineering firm JDS Energy & Mining Inc., under the direction of John Sagman, P.Eng., Senior Vice President and Chief Operating Officer of Wellgreen Platinum. Other contributors to the 2015 PEA were SNC- Lavalin, Knight Piésold Ltd., SRK Consulting (U.S.) Inc., Eggert Engineering Inc., and GeoSim Services Inc. 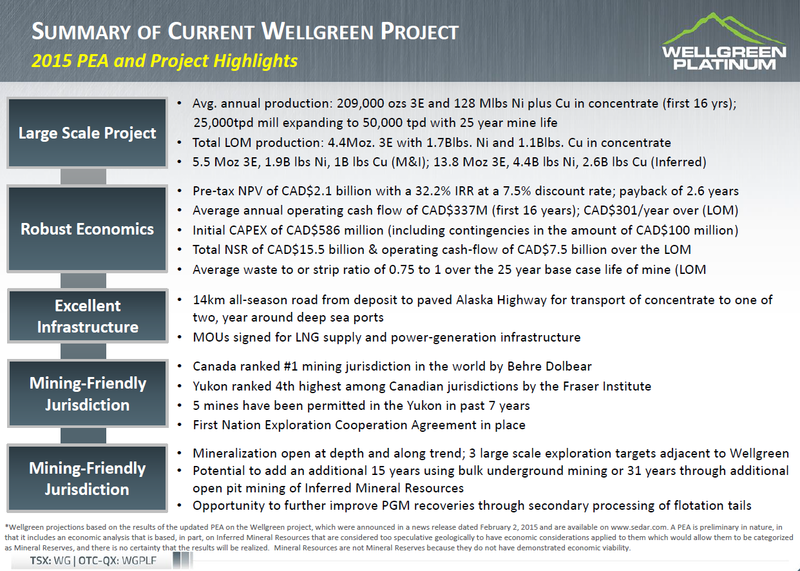 The Wellgreen project is envisioned as a conventional open pit operation, with some selective higher grade underground mining. Milling would start at 25,000 tonnes per day (tpd) for the first five years of operation, then would scale up to 50,000 tpd for an additional 20 years. 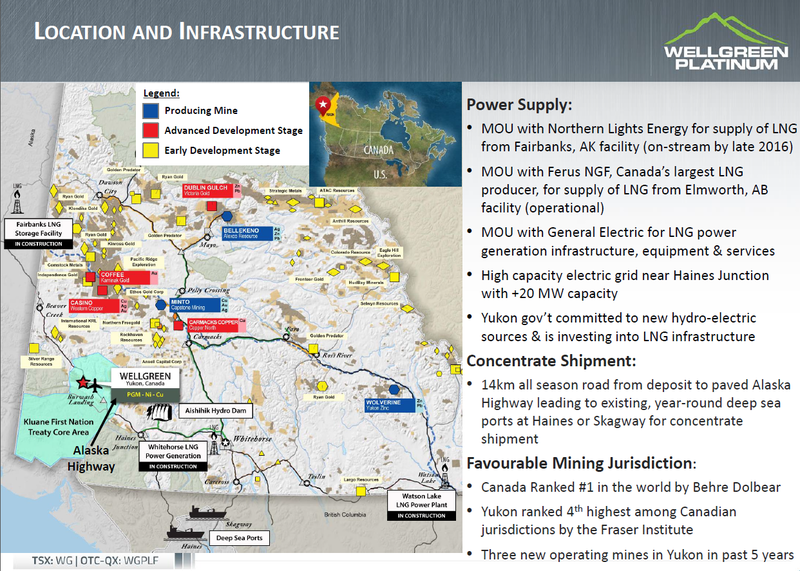 Under the base case of the 2015 PEA, the mill would produce a bulk Ni-Cu-Co- PGM-Au concentrate through conventional sulphide flotation for shipping via existing deep sea ports south of the project in Alaska. 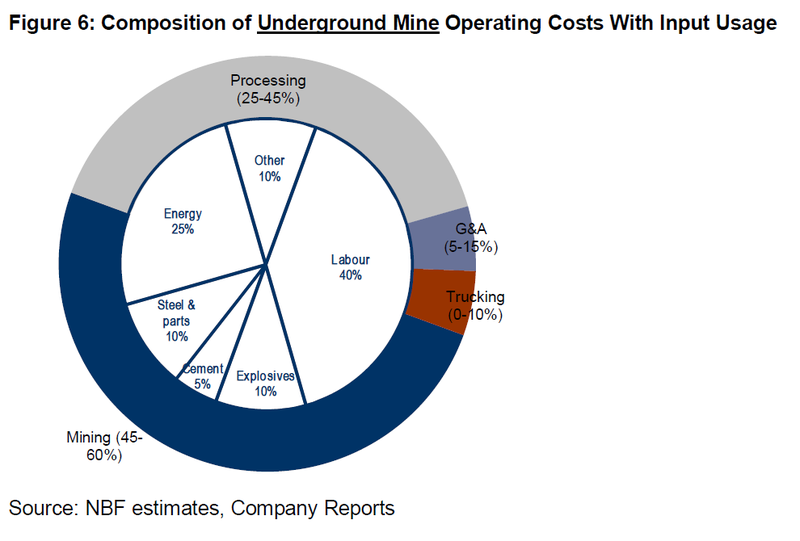 It should be noted that the study also details a number of opportunities to further enhance economics (see below) and the current Mineral Resource remains open along strike and at depth. 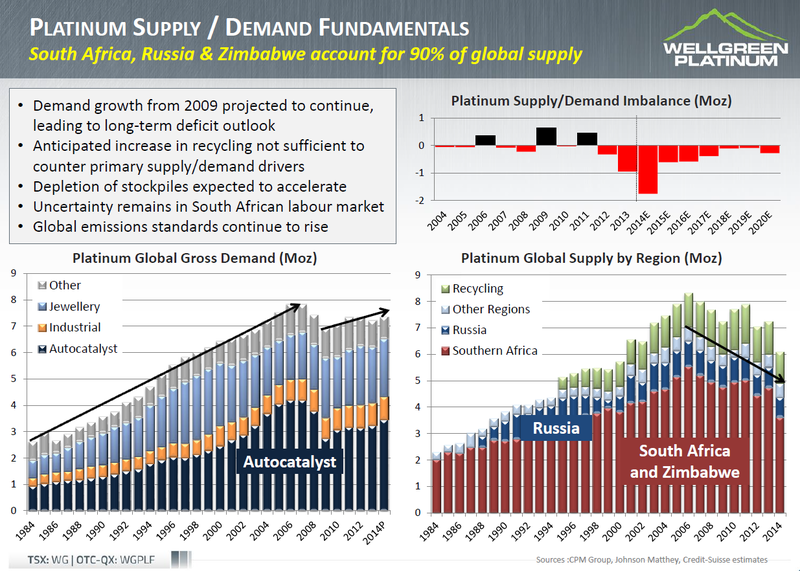 Average annual production of 208,880 ounces of platinum+palladium+gold (3E) (42% Pt, 51% Pd and 7% Au), along with 73 million pounds of nickel and 55 million pounds of copper over the first 16 years of operation at a production grade of 1.88 g/t platinum equivalent (Pt Eq.) 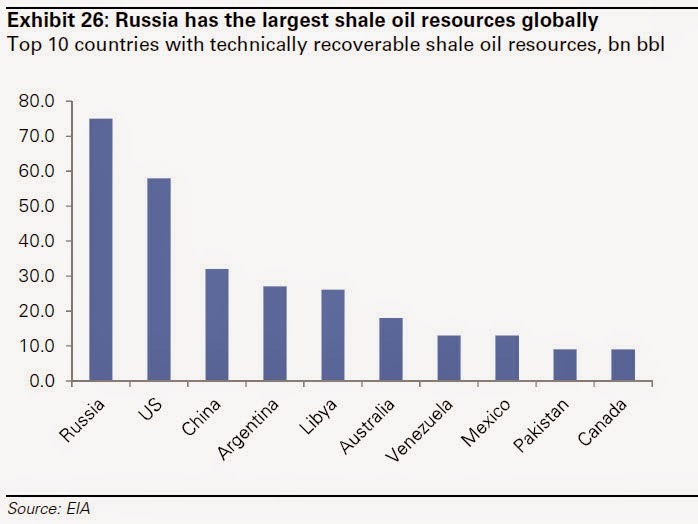 or 0.50% nickel equivalent (Ni Eq.) 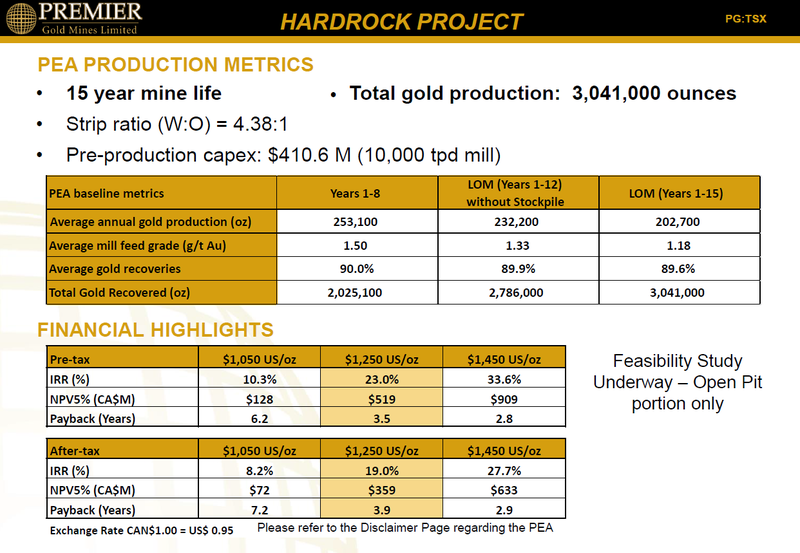 (0.63 g/t 3E (46% Pt, 45% Pd and 8% Au), 0.27% Ni and 0.18% Cu), which equates to a net smelter return (NSR) of CAD$38.60 per tonne milled using the base case metal price assumptions set out below. Average strip ratio of 0.75 to 1 over the 25 year base case life of mine (LOM). 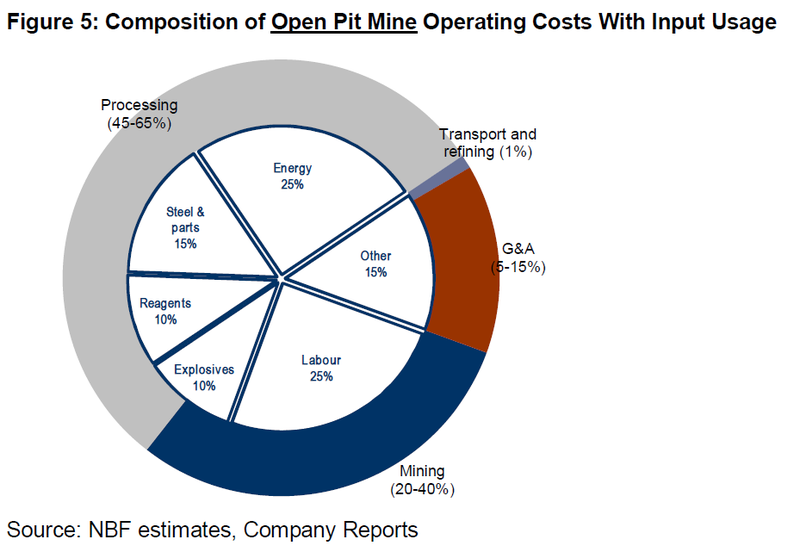 LOM production to average 177,536 ounces of 3E (42% Pt, 51% Pd and 7% Au), 68 million pounds of nickel and 44 million pounds of copper per year over 25 years with the potential to add an additional 15 years using bulk underground mining or 31 years through additional open pit mining of Inferred Mineral Resources. 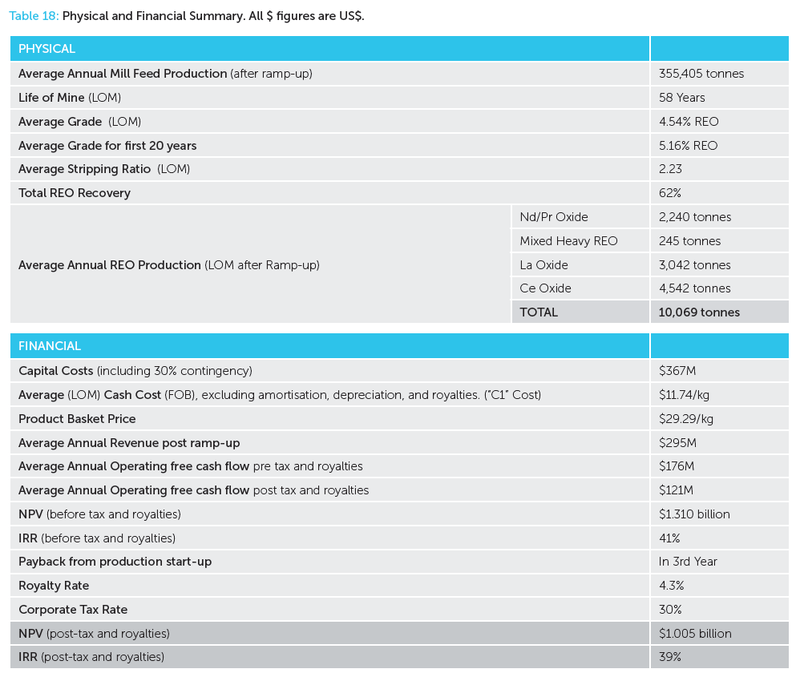 Total LOM production of 4.4 million ounces of 3E (42% Pt, 51% Pd and 7% Au), with 1.7 billion pounds of nickel and 1.1 billion pounds of copper in concentrate from approximately 34% of the current pit constrained Mineral Resource. 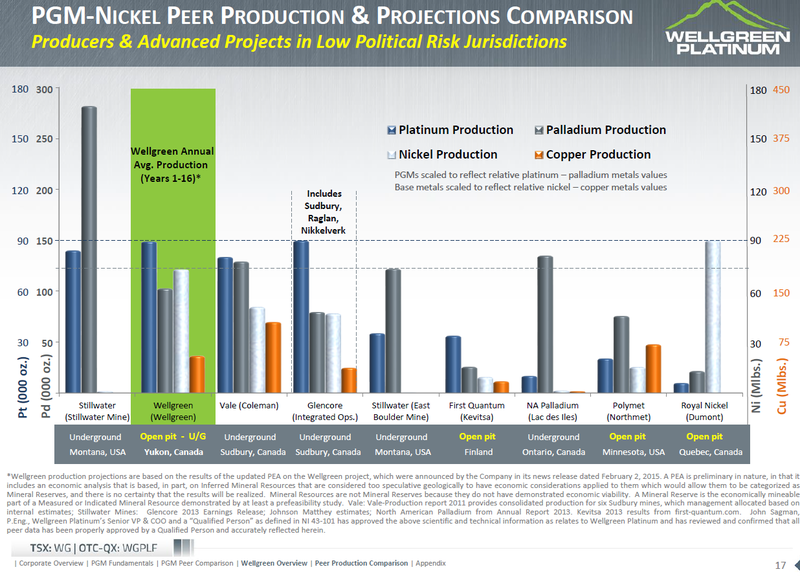 In terms of platinum production, based on the 2015 PEA, the Wellgreen project could be one of the two largest platinum producing mines (along with the Stillwater Mine in the United States) outside of South Africa or Russia(2)..
Codelco, the world's largest copper company, is planning to reduce costs by $1 billion in 2015, as the copper price remains mired in lows not seen since recessionary 2009. Speaking to journalists on Friday, Codelco's CEO, Nelson Pizarro, said the company aims to cut direct cash costs by $0.193 a pound, Reuters reported, against average cash costs of $1.537 per pound between last January and September. The austerity measures will not result in layoffs, nor will the company's large investment projects be put at risk, according to Pizarro. Half a billion in efficiencies will be gained by renegotiating energy contracts – made possible through slumping oil prices – along with a lower Chilean peso, which has weakened around 25 percent versus the US dollar, said Reuters, quoting Pizarro. The Chilean state-run miner is also looking to boost copper production by 35,000 tonnes in 2015, thereby putting another $200 million into its treasury, the publication notes..